While fifty dollars may not seem like much when it comes to fishing equipment, many anglers would rather get into fishing without spending an arm and a leg. Typically you’ll hear and read some experts tell you that the best spinning reels you can buy are priced around $100. That’s simply not true. There are quality reels that can be bought for 50 dollars and under. I’m going to show you what I find to be the best spinning reel under 50 dollars as well as some other very good options. You don’t need to be rich to enjoy this sport, nor do you need a lot of money. Read on to see what I’m talking about! If you are looking for the best spinning reel, you can find our top 3 guide on the matter. Some are very expensive, but if you’re filling a particular need you may have better luck with one of those reels. Don’t forget to pair your reel with the best spinning rods available. It’s one thing to have a great reel, but you’ll need to pair it with an equally great rod to really appreciate the equipment! You may just want to see what our pick for best spinning reel under 50 dollars is, which is just fine. But you need to understand a few things when buying a spinning reel for under 50 dollars. Size: By and large, any big name brand reel that is priced below 50 dollars will be a smaller sized reel. For instance, you may be interested in the Pflueger President Spinning Reel. Not surprised, it’s a really nice spinning reel. But, if you’re looking to spend less than 50 dollars, you will only be able to buy their smallest size reel, the 20 size. This reel is great for streams, rivers and smaller fish. But do not expect to spool a lot of line, especially stronger line, on a small reel like that. You have to understand what type of fishing you’ll plan on doing before you make that purchase. Type of Water: What type of water do you plan on fishing? If you’re fishing freshwater you should have loads of options to fit your budget. If you’re looking for something cheap on the ocean, you will have choices but you’ll need to research what materials make up the spinning reel. Metals will erode over time as they get beaten up by saltwater. Type of Line: Not all fishing line works on all spinning reels. This plays into size, but if you like to fish with braided line you’ll have to make sure the line fits the reel you’re buying. Believe me, it makes a difference. Each reel has a table that indicates what kind of fishing line it can be spooled with. Consult that table if you’re keen on specific types of line. Again, none of these factors will dissuade you from buying a spinning reel under 50 dollars. Nor, will they prevent you from buying a good one. But, as suggested, you should keep those factors in mind before making a purchase. This is a fantastic reel for a great price. Amazon prices fluctuate, so be sure to click on either the name or image of the reel to get the latest prices. But from what I’ve seen, this reel in various sizes can be purchased for under 50 dollars. And it is worth it. First of all, this is a graphite reel. This means you can take it in fresh or saltwater. Great for durability and that also makes it light. If you fish for hours, you will be thankful you’re not casting and reeling a heavy reel over and over again. Secondly, this is japanese construction. Okuma makes quality and you can be confident this reel will stand the test of time. Additionally, it is built with six stainless steel ball bearings. That means smooth retrieval after every cast. For under 50 dollars, that is fantastic! This reel also comes with the bait feeder system, which is great for riverbank fishing for catfish or carp. Cast out your bait, set the bait feeder and wait. The bait feeder disables the drag so when a fish takes the bait it allows the fish to eat it rather than feel any kind of tension on the line. Flip the bait feeder back into position and set the hook! A great feature you just don’t find on many reels! This reel has it all at a great price, which is why it is our best spinning reel under 50 dollars. Not that it needs stating, but this reel is obviously one of the best saltwater spinning reels under 50, if not the best. You can check out their product page on Amazon for a nice table explaining the differences in reel sizes and what type of fishing line you can spool on them. Okuma has developed a legendary reputation in the industry with its high quality products. Year after year they develop some of the worlds’ best fishing equipment. The Avenger ABF is no slouch and will absolutely withstand the punishment of trophy fish and extreme weather each time out. We like this reel a lot and suggest you give it a try! 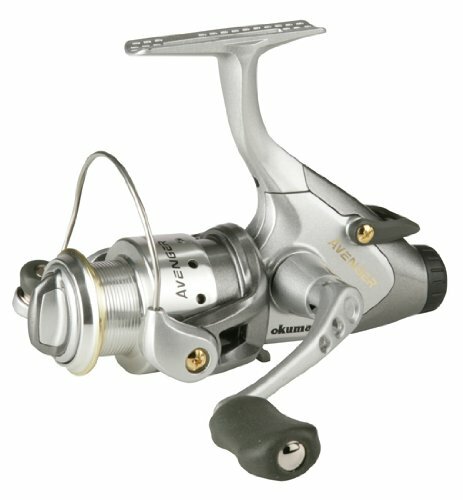 Another solid choice for a spinning reel under 50 dollars is the Shimano Sienna Fe. Unlike the Okuma, this is more of a no-frills, gets the job done fishing reel. The big feature this reel has is its M Compact body design. It’s light, works well in freshwater and inshore, and with a big grip gives you maximized control. The Dyna-Balance design in this reel eliminates or at the very least greatly reduces the vibration you feel in the rod on the retrieve. This little reel has a 5.0:1 gear ratio which hauls in line at an incredible 24 inches per crank! Finally, this reel features an updated spool design as part of their Propulsion Line Management System. This update helps boost cast lengths and reduce wind knots and backlashes. Quite a nice reel for under 50 dollars. Check Amazon for the latest pricing and please note, not all sizes are under 50 dollars. KastKing is an interesting manufacturer. They came onto the scene a couple years ago and really have made a name for themselves on Amazon. I don’t believe you can find them in traditional storefronts because they’re made by a company specializing in e-commerce. All that aside, they make a pretty good affordable fishing reel. The Centron prices for well under 50 dollars. Actually, the Centron is probably the best spinning reel under 30 dollars, which is impressive that for its price it still competes with more expensive options. Its graphite construction means it’s great for both fresh and saltwater. It’s not the lightest reel, but it’s not overbearing. It does come equipped with nine stainless steel ball bearings which is awesome for any reel! The style makes it one of the most attractive reels you can buy but looks aren’t everything- this reel performs, too. Looking for and finding a quality reel at the right price can be a task sometimes. These three choices are worthy for consideration on any budget, but particularly if you’re looking for the best spinning reel under 50 dollars. Going into the new year, feel confident you can buy any one of these three fine choices and have a great reel on your side to land quality fish! All three choices are good ones, but if you want the best, pick the Okuma. If you want a no-frills, just get down to business reel, the Shimano is your pick. Remember, the larger sized Shimano’s are priced above 50 dollars, so keep that in mind. Finally, the newcomer in the market, the KastKing Centron offers a lot of features and good design in a really, really affordable price. If you’re not scared to try something new, you might want to give them a shot. You may become a fan!